I used to be a dragonfly, I used to tip toe on the water because I needed to. Now I look for shelter in the music when you sing for me, because the music is what I need today, for something like a human experience. But nobody remembers me here, not the swallows, not the restless drum beat. Not the grasshoppers, not the street corner choirs or the nations we now call rhythm. Not the inconsistent storytellers fighting for the microphone and the sacred spot under the soft light, where I’ve been radiant and complicated, where I’ve been loose and sometimes needy but I never looked for shelter in the things you sent to free me. So… Don’t forgive me, please, don’t forgive me. Let me suffer just a little, love me more because I’m selfish. Listen harder, I still talk a lot and feel too loud. Don’t remind me what’s been missing, let me look for it, and find you, because my pulse keeps running away from me. My pulse keeps running away from me. I’m not conscious anymore, sacred things are scared of me, they scatter and they burn. I can’t be still for long enough. I can’t remember how to pray or how to wait for things I trust. I break the truth when I see it in a mirror, into fantastic bits of disharmony, trying to save face and buy time and stay high but my high keeps running away from me. My high keeps running away from me. It’s always chasing unicorns because it’s not so hard to let them go. But I don’t believe in fairytales, except the one about the Carpenter, sometimes. It sounds too good to disregard. He claims he’ll teach me how to listen and he’ll teach me how to laugh. He seems to know that learning is a mission for me, so he says he’ll teach without instruction, not one kiss not one distraction. But he’s been so preoccupied, and I think he’s a bit too cool for saving me, and I don’t believe in miracles, and I don’t believe in love, not the human kind of love that cuts and bleeds, bleeding is easy. to listen, and I’ve forgotten how to laugh, but I’d still like to get there, I still need to get there, I need to get to heaven where I used to be a dragonfly, where I used to tip toe on the water because I needed to. This poem was the one that was going to heal me. A little more pain, a lot more faith, a little more pain. A lot more faith, a little more faith, a little more faith. 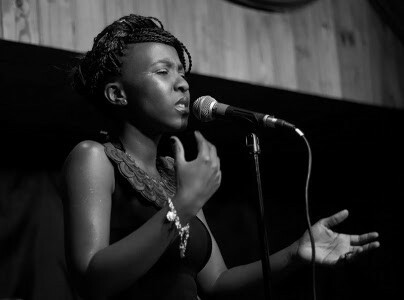 Mandisa Mabuthoe is a poet, play writer and vocalist from Gaborone, Botswana. Her work has been featured in Voiceworks Magazine, Prairie Schooner Online Journal, and Dreaming is a Gift for Me, an audio collection of Botswana poets. In 2014 she released her first EP, I Used to Be a Dragonfly. She has performed on several international stages including Federation Square in Melbourne, Shoko Festival in Harare, Harare International Festival of the Arts (HIFA), and Maun International Festival of the Arts. She also facilitates creative writing workshops in Gaborone. She is currently a member of a six piece band, The Contrabanditz.